Everyone dreads tax season, but at least there’s one thing to look forward to – your tax refund! Every year, the federal government gives back hundreds of billions of dollars to taxpayers who paid too much. But not all taxpayers receive the same amount. 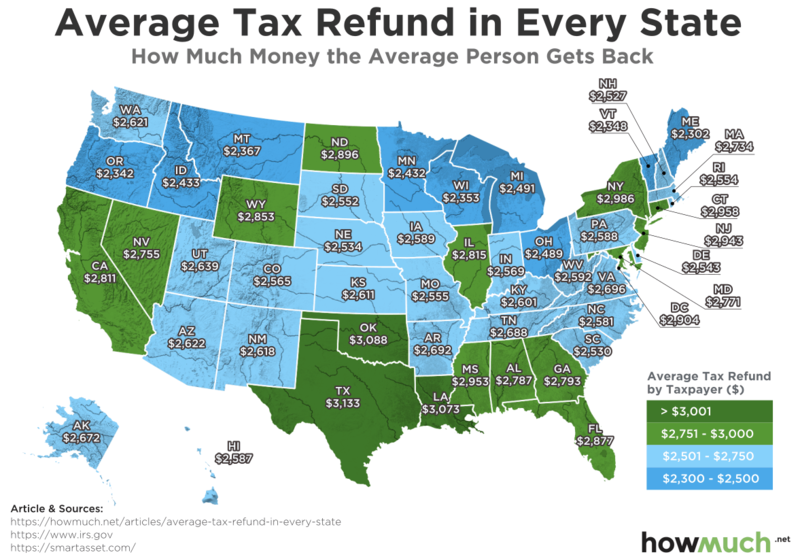 Take a look at our map below to see the average tax refund in every state. In the map above, states are split into four groups depending of the size of their average tax refund. Dark green states have average tax refunds over $3,001, light green states between $2,751 and $3,000, light blue states between $2,501 and $2,750 and dark blue states between $2,300 and $2,500. The data were collected from the IRS and SmartAssset.com. In 2017, the IRS returned $324 billion back to taxpayers. According to IRS data, the average tax refund was $2,895 per taxpayer. But that’s just the average. The refunds received by taxpayers varied significantly between states and was within a range of between $2,302 and $3,133. There are only three states where the average tax refund was more than $3,000: Texas, Oklahoma and Louisiana. Taxpayers in Texas received the most on average at $3,133 per taxpayer. That compares to the national average of $2,895. Additionally, Texas is one of the seven states that do not tax earned income. If you’re really looking to save on taxes, Texas is the place to be. The three states with the lowest average were Maine, Oregon and Vermont. Maine had the lowest average tax refund in the country at $2,302 per taxpayer. One thing to notice is that eight of the 10 states with the lowest tax refund share a border with Canada. Also, states with refunds lower than average tend to states with low populations, but there are a few exceptions. Another thing to notice is that the states with the lowest tax refunds are further away from the national average than the states with the highest refunds. Texas is only $238 above the average ($3133 - $2895). The bottom five states – Maine, Oregon, Vermont, Wisconsin and Montana – are all more than $500 away from the average, more than double the distance from the average of Texas. This is because the four most populated states in the country – California, Florida, New York and Texas – all had relatively larger refunds compared to smaller states. This weighed the average national refund higher. If you’re looking to save the most on your taxes, you still might want to move away from the border with Canada and towards a southern state. If you are considering moving to a new state to save on taxes, then Texas is that best choice. Either way, you’ll only save a few hundred dollars. But if you’re a penny pincher, every dollar counts!